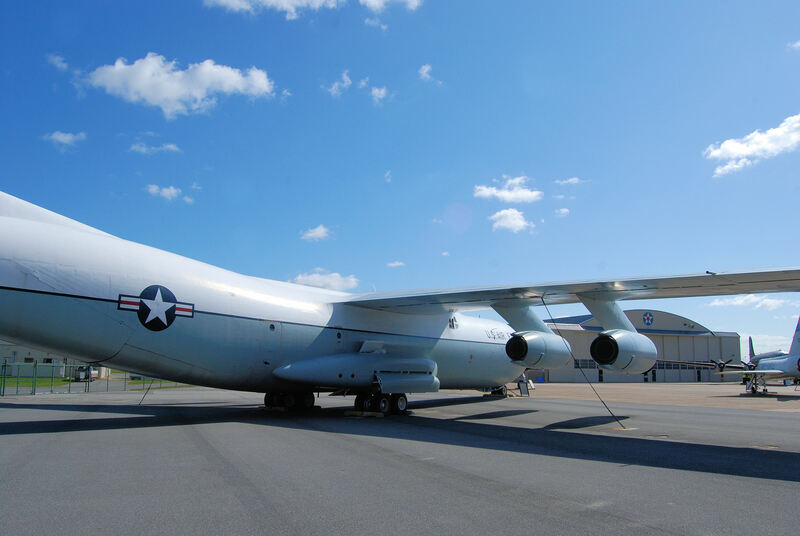 Serial number 61-2775 was the very first of 284 C-141A Starlifters ever built and had its maiden flight on 17 December 1963, the 60th Anniversary of the Wright Brothers first flight. 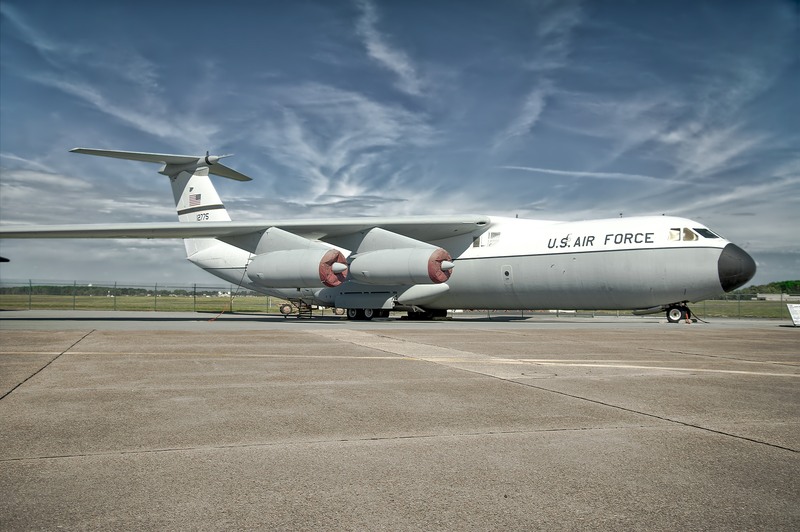 This C-141A Starlifter spent its entire career as a test aircraft in numerous programs. It is one of only two remaining “A” models and is the only known four engine jet used to tow a glider. 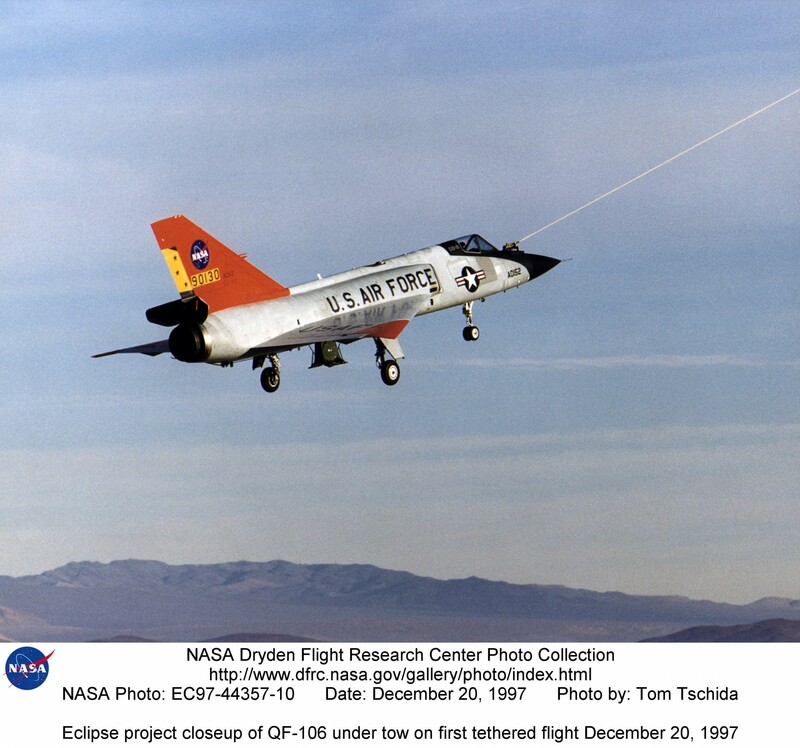 The last program this A model carried out, known as Eclipse, was to test a new tension rope from NASA while towing a QF-106 in air. 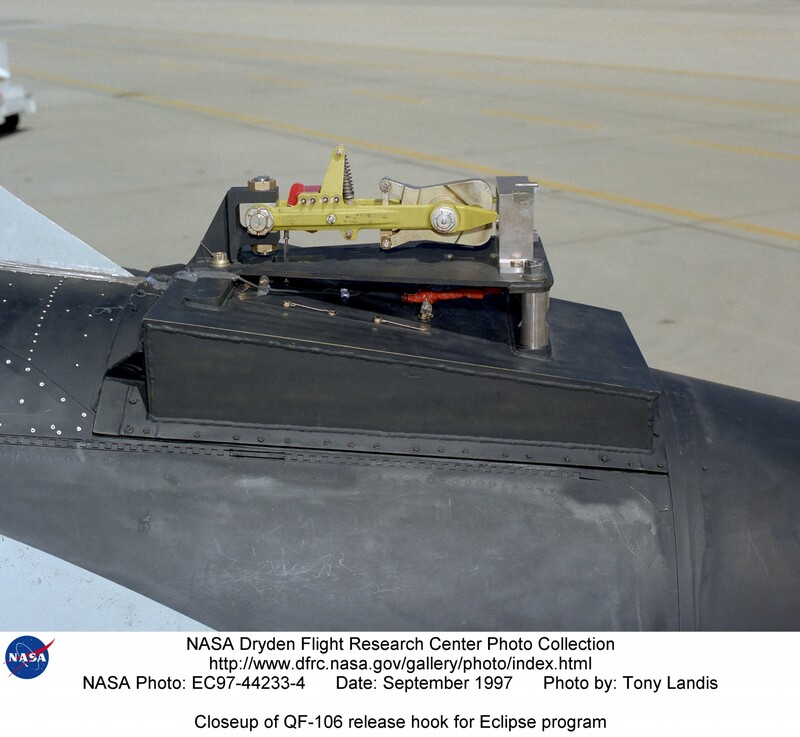 NASA Dryden Flight Research Center supported a Kelly Space and Technology, Inc. (KST)/U.S. Air Force project, known as Eclipse, which demonstrated a reusable tow launch vehicle concept. The purpose of the project was to demonstrate a reusable tow launch vehicle concept conceived and patented by KST. 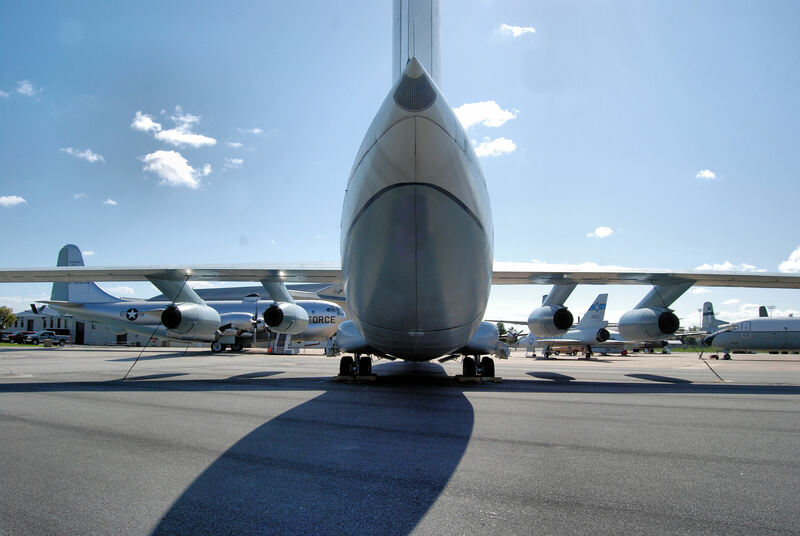 Kelly Space obtained a contract with the USAF Research Laboratory for the tow launch demonstration project under the Small Business Innovation Research (SBIR) program. 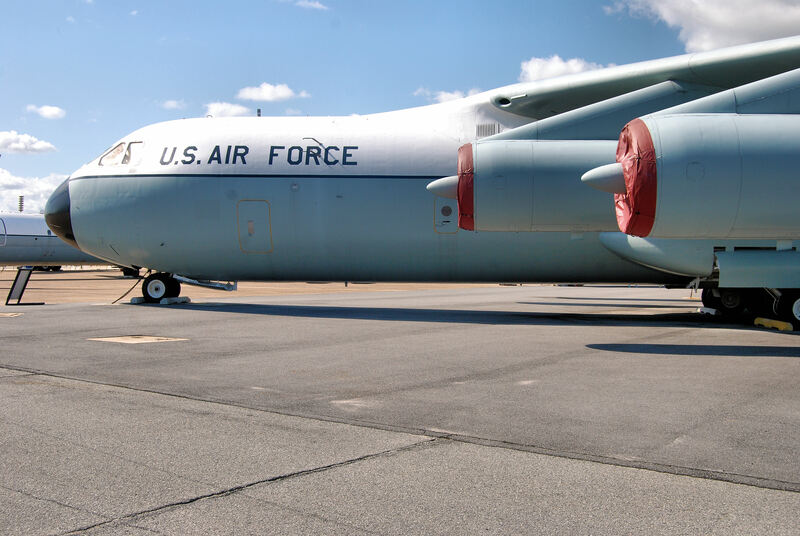 The USAF SBIR contract included the modifications to turn the QF-106 into the Experimental Demonstrator #1 (EXD-01), and C-141A aircraft to incorporate the tow provisions to link the two aircraft, as well as conducting flight tests. 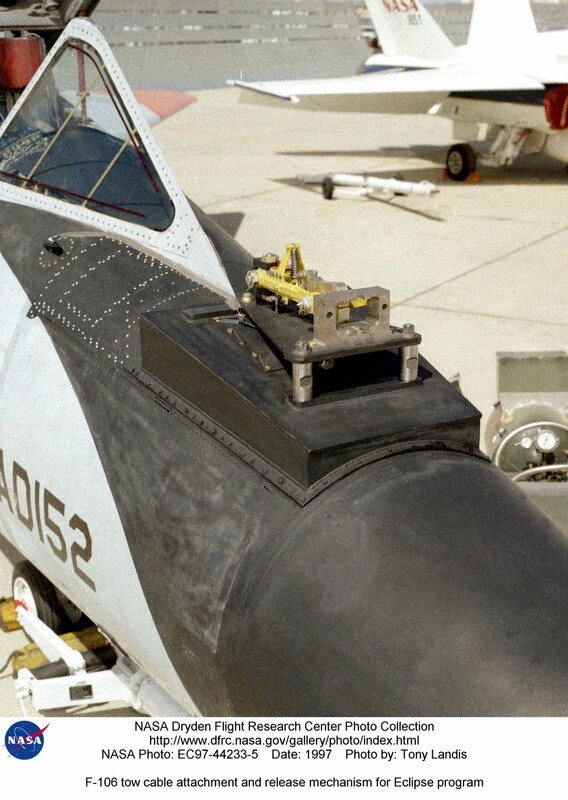 The demonstration consisted of ground and flight tests. These included a Combined Systems Test of both airplanes joined by a tow rope, a towed taxi test, and six towed flights. 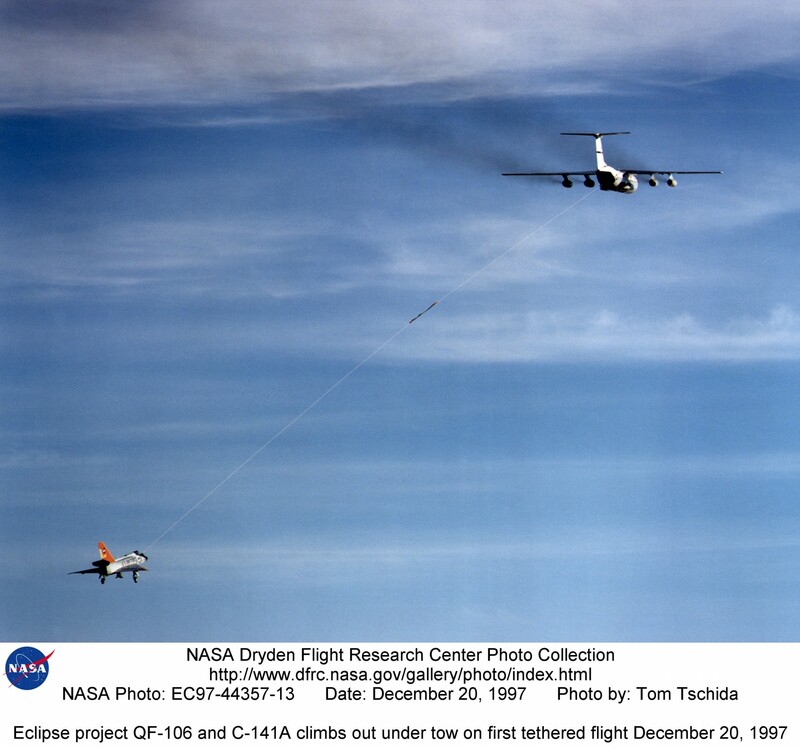 The project’s primary goal of demonstrating the tow phase of the Eclipse concept using a scaled-down tow aircraft (C-141A) and a representative aerodynamically-shaped aircraft (QF-106A) as a launch vehicle was successfully accomplished. 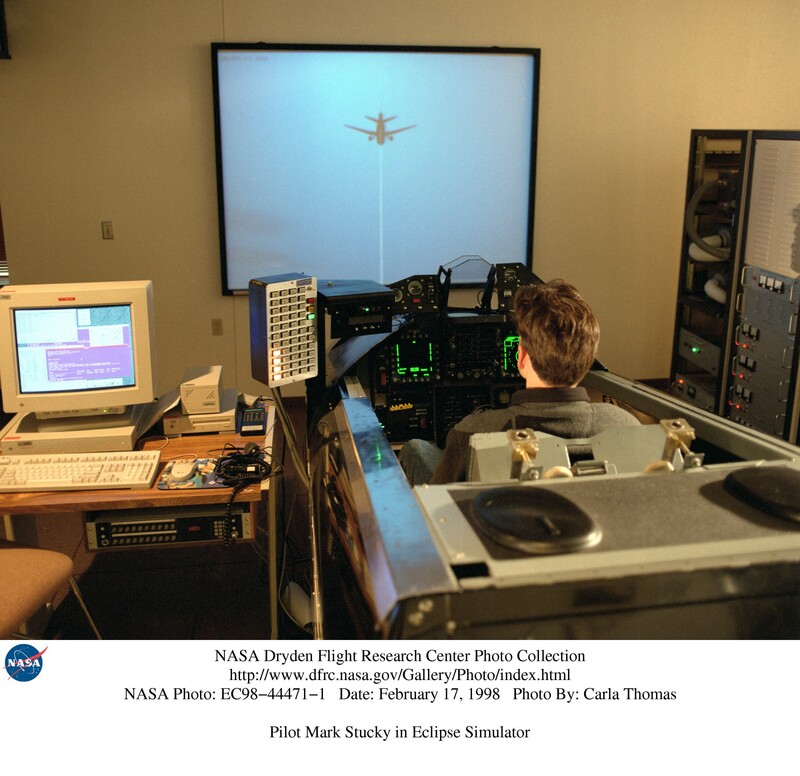 On Feb. 6, 1998, the Eclipse project made its sixth and final towed flight, bringing the project to a successful completion. 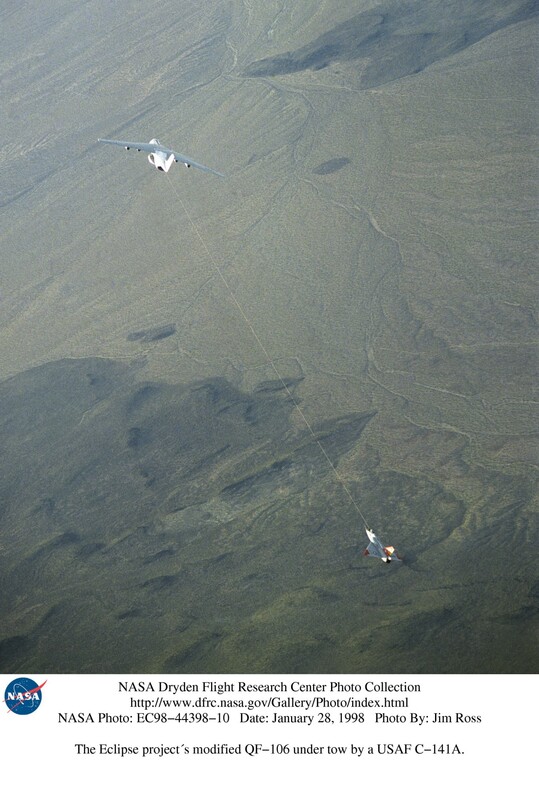 Preliminary flight results determined that the handling qualities of the QF-106 on tow were very stable; actual flight measured values of tow rope tension were well within predictions by the simulation, aerodynamic characteristics and elastic properties of the tow rope were a significant component of the towing system; and Dryden’s high-fidelity simulation provided a representative model of the performance of the QF-106 and C-141A airplanes in tow configuration. Total time on tow for the entire project was 5 hours, 34 minutes, and 29 seconds. All six flights were highly productive, and all project objectives were achieved. I was a port dawg with the 58th APS and in 1993 merged with the 67th APS at Hill AFB, UT. 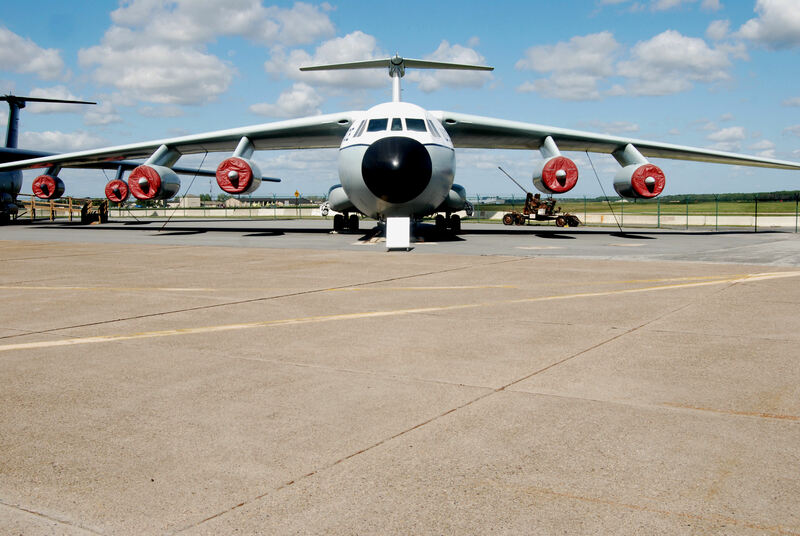 The C-141 was my baby. I loved downloading and uploading cargo and pax on this bird. It was easy to load plan because the weight and balance were so simple. 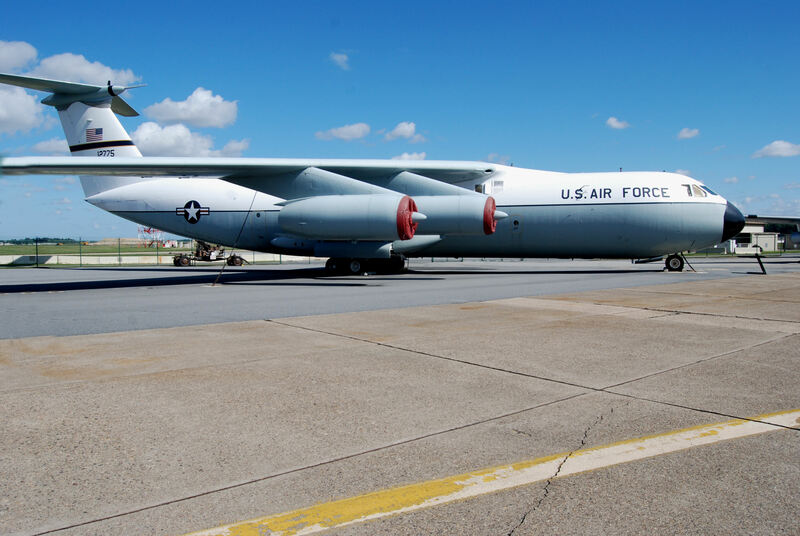 I retired in 2002 and they retired the starlifter in 2006. I was to see it go. But that was my bird. It came on board when I was a fifth grader at Nellis AFB, and we retired almost together just four years apart. The First of the Fleet 61-2775 also participated in Operation Desert Shield/Desert Storm. 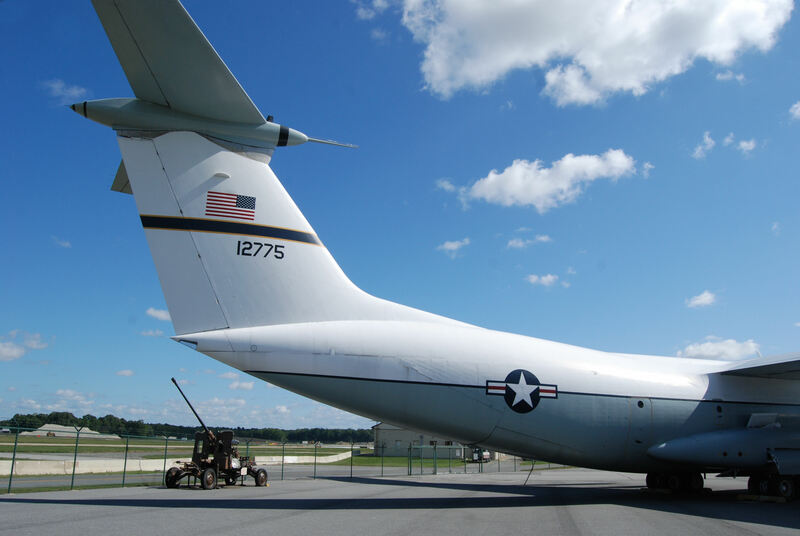 2775 and 2776 Were the only two C-141A models to fly support missions. One on the first mission I was the Crew Chief on 2775 and Robert Henseleit was the Crew Chief on 2776. Both aircraft had a 97% reliability rate for all the missions flown. 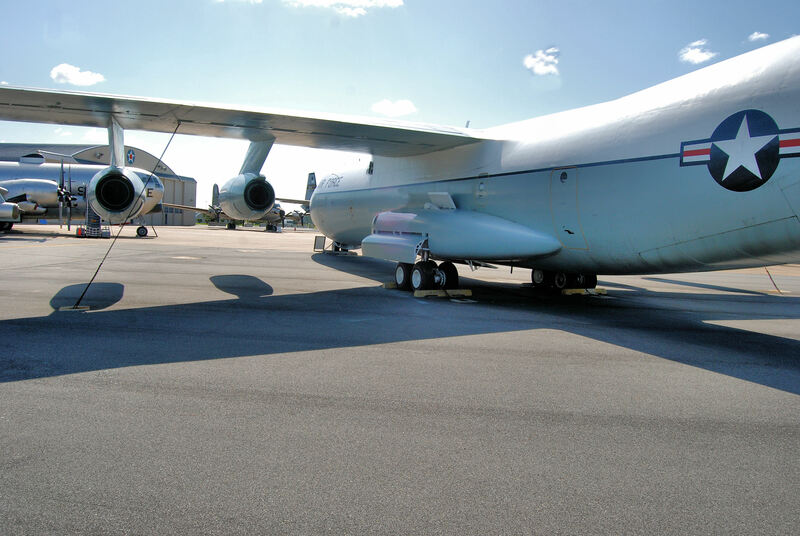 Both aircraft were de-moded and were readied for cargo and personnel support missions throughout the world. 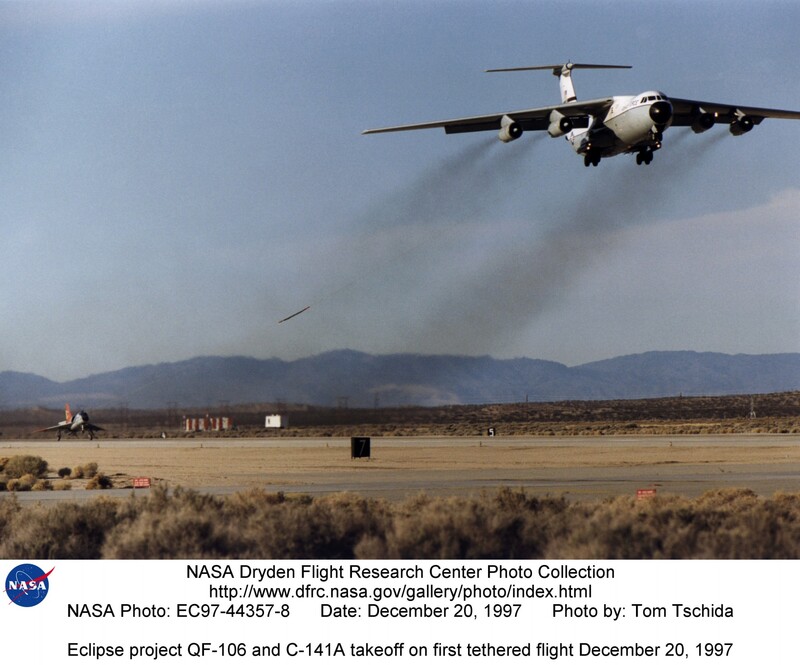 Does anyone out there know the stall speed of the C-141? 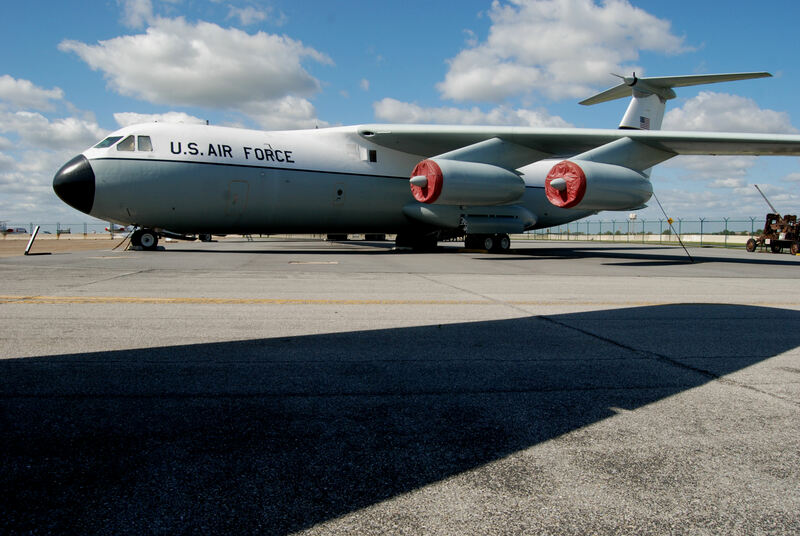 I was a paratrooper in 1970 and in the first class that made all of our 5 qualifying jumps from the C-141. When the Jumpmaster would open the rear doors and deploy the spoilers, the noise was deafening and just added to our fear. I’m thinking it was somewhere around 130 mph, about the same speed as the wind of Hurricane Irma. My first assignment from reserve travis to norton acrive 141b jet shop hot and heavy miss it. C141A Pilot, 1969/1973, 60th Wing, 938 MAG, Travis AFB, CA. 1900+ hrs. 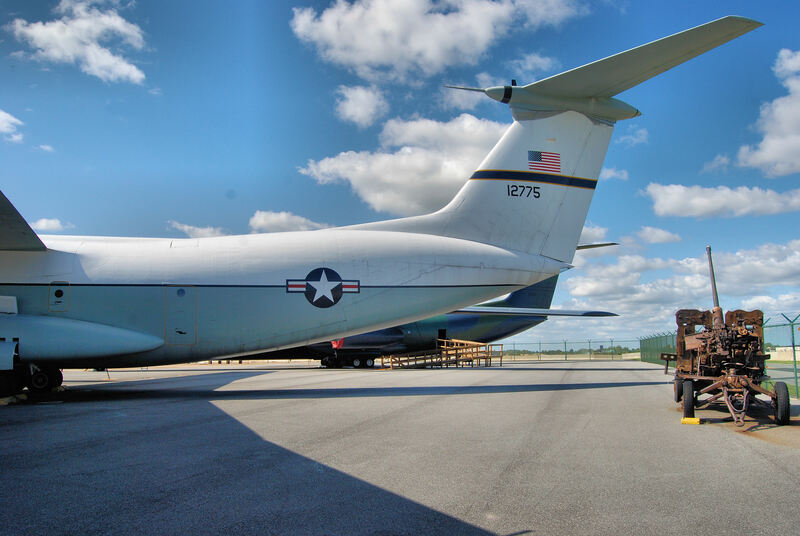 with many cargo flights to Vietnam and many Air Evac flights in return to Hickam with the patient load. Air Evac from Yokota also. Several Reforger flights to Ramstein Germany. Fun plane to fly. Example: Cold day, Misawa, Japan, empty plane, max power before brake release, keep on runway past rotation speed. Yoke back. It climbed like a fighter to 20,000. ATC departure was surprised at the climb rate. I briefly saw what must have been the NASA C-141 taxiing on the Southeast ramp while I was working in a hanger at MIA in February, 2016. Couldn’t make out a tail number but did some looking on line. It was reported stored in Feb when I saw it. 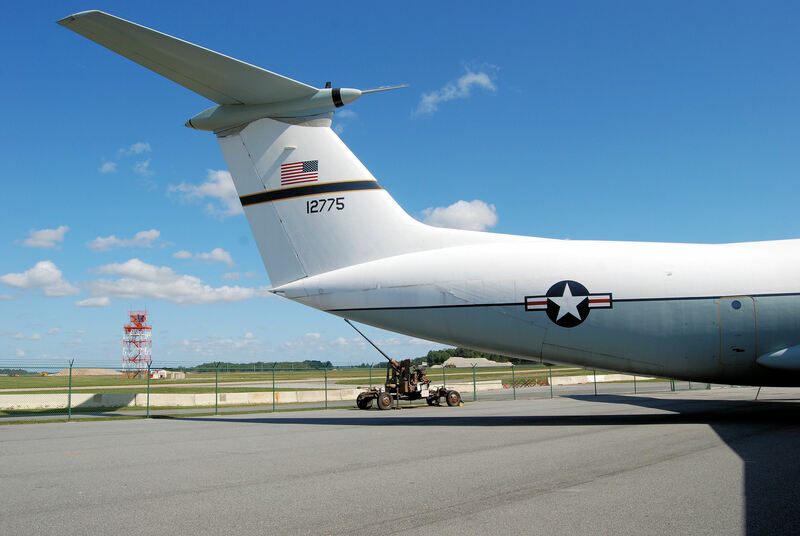 I was stationed at Charleston AFB early 70s (C-141A) before the conversion to “B” models. very helpful information. I had doubts about the number of aircraft and also wasn´t sure about the years of construction. Stationed at Altus AFB 69-75, crew chief on various tail numbers and supervised the Home Station Check team. Actually, 286 StarLifters were built, 284 for USAF, 1 for NASA, and 1 for a private air freight company. I’ve forgotten that company’s name. Thank you for this beautiful page honoring 61-2775, known by Lockheed simply as 12775. Many years ago, Lockheed sent me a picture of her on her maiden flight bearing this tail number. Many years later, you sent me a picture of her in her gray-and-white livery. Many thanks! Thank you bringing this up!